Senior coalition official close to Prime Minister says if Defense Minister quits gov't, decision will lead to early elections. Defense Minister Avigdor Liberman’s apparent plans to resign from the governing coalition would lead to the end of the 20th Knesset and early elections, a senior coalition official close to the Prime Minister said Wednesday. Liberman called for a special Yisrael Beytenu faction meeting on Wednesday at noon, to be followed by a major public announcement. The news prompted speculation the Defense Minister may be planning to resign from the coalition over his disagreement with Tuesday’s ceasefire deal with Hamas. Officials close to Liberman confirmed that he is planning to quit the Defense Ministry as a result of his ongoing frustration with the government’s handling of the crisis with Hamas. The minister’s office neither confirmed nor denied the claims. 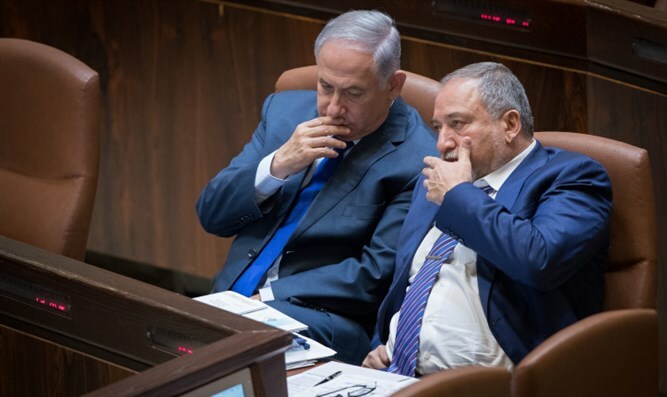 Shortly thereafter, a senior coalition official close to Prime Minister Netanyahu said that if Liberman does in fact resign, it would spell the end of the government and force early elections. Tuesday’s ceasefire agreement ends the biggest flare up between Israel and the Gaza Strip since the summer of 2014. Some 500 rockets and mortar shells were launched from the Hamas-ruled coastal enclave towards Israel since Sunday night, following an incident in the southern Gaza Strip between an elite IDF special forces unit and a cell of Hamas terrorists. One person was killed and nearly 60 more injured in the rocket attacks. The Defense Minister’s office has not released any details regarding the content of Liberman’s upcoming statement, and refused to comment on rumors he intends to resign his position as Defense Minister. On Tuesday, Liberman’s office denied claims by the Prime Minister’s Office that the Defense Minister had backed the ceasefire agreement. The PMO had claimed that the security cabinet unanimously approved the proposed ceasefire. “The reports of Defense Minister Avigdor Liberman’s supposed support for the ceasefire in Gaza are ‘fake news’,” his office claimed. Education Minister Naftali Bennett (Jewish Home) also challenged the PMO’s claims of a unanimous decision in favor of the ceasefire.